Gigajam is available to schools in Amsterdam via their Broadband network for schools (BOA) and on Monday the 11th July BOA presented a new service for schools, Drive in Muziekschool. It is a mobile classroom solution for schools who do not have dedicated IT support yet wish to provide more opportunities for students to learn how to play a musical instrument. The Drive in musiziekschool concept is a mobile workstation containing desking, a band set of instruments (guitar, bass, keyboard and drums) and laptops pre installed with Gigajam lesson content and software – ready to go! Saranna Maureau, project manager for BOA launched the concept at the Wagg Society in Amsterdam to an audience including schools teachers, teacher trainers, Kennisnet http://www.kennisnet.nl/, KPN (http://www.kpn.com/ Dutch telecom network provider) and QLICT (http://www.qlict.com/ Schools network management provider). BOA are the Broadband for Schools Network, http://www.boa-amsterdam.nl/nl/home/ which runs across the City of Amsterdam. They have selected Gigajam as a content provider for their schools and now provide access to Gigajam’s Online Music School http://gigajamvle.com across their network. This provides the opportunity for all Amsterdam students to learn to play a musical instrument; guitar, bass, keyboard and drums, in school and at home. BOA work hard to help their schools develop innovative uses of technology to support and develop learning and increasing access. Gigajam Drive In is a mobile classsroom solution for musical instrument tuition. The scheme will see BOA delivering pre installed laptops, Yamaha instruments and, of course, access to Gigajam via the BOA network. The scheme is aimed at supporting smaller schools with no dedicated network technicians so that they have a plug and play experience. Gigajam is available to City of Amsterdam schools via http://gigajamvle.com and the early lessons can be followed in both English and Dutch, to support younger students. One Man Band in Banbury, Gigajam’s long term supplier partner of instruments to schools, have released a series of superb new deals on their Yamaha instrument bundles, recommended for use with Gigajam. These deals are only available to education and One Man Band is the sole importer of the Yamaha EZ-AG MIDI controller guitars. They come with free delivery and work perfectly with Gigajam on Apple and Windows. Call us now to discuss your ideas and thoughts for developing your classroom with Gigajam , or contact David Cooper directly if you are interested in the instruments only. Sharing and letting people know what you are up to is great fun, so Gigajam Online now enables you to share your latest achievements and your latest progress with friends and family using Twitter and Facebook. You can share and let people know when you have completed a lesson. If you use Gigajam’s award winning ePortfolio then you can also share your exercise scores and course progress. 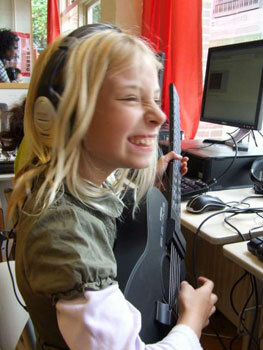 The newest recruit to Gigajam’s Online Music School in Amsterdam is Posiedon, which is a small Primary school. From the Review’s initial assumptions, through to the government’s response, Mr Gove and Mr Vaisey have demonstrated their belief in and support for music. They have further confirmed this with, what in the current climate, is generous dedicated funding . Mr Henley has provided a strong and clear understanding of the landscape of music education in England together with 36 recommendations which are equally strong and clear. We are particularly delighted that Mr Henley has recommended that there is further work to be done to understand the positive impact that technology can play in our music education system. The previous government did not respond to the call for a digital component, to our music education system, following the second Music Manifesto report. It was, in our opinion, a missed opportunity to provide a broader blend of solutions that would move us closer to the widely shared aspiration that all children should have the chance to learn a musical instrument and sing. We know that an e-learning model can significantly increase participation levels in school based musical instrument lessons, we’ve seen it happening live in classrooms. A model for e-learning should work alongside existing methods of delivery, especially when part of a school based music hub. It can be available online, at school and at home, and help music teachers and practitioners reach and support many more students than is currently possible. Up skilling of musicians so that they can continue to, and in time, increase the contribution music and associated creative industries make to the UK economy. The Wider Opportunities model of instrumental tuition, for a single year group, has provided many more children with the chance to learn a musical instrument, but, the scheme itself shines a clear and bright light on the ‘elephant in the room’, namely, scale. It is clearly not possible to deliver sustained instrumental tuition using the existing traditional models of delivery alone – there will never be enough money and there will never be enough instrumental teachers. Mr Henley indicates in his report that Wider Opportunities programmes may, in the future, need to be just a term in duration before the requirement of a parental contribution. Ofsted, though, have clearly indicated that many schemes, however good they are in themselves, are already not of sufficient duration to enable children to learn to play an instrument in a way that supports genuine progression. We believe that the system can do more, if we add: digital curriculum, interactive technologies, workforce development and innovative, cogent delivery models. My colleagues and I worked hard on our submission to the review and we understand that further work to be undertaken to develop a national plan for technology would be a part of the National Plan for Music. We have written to Mr Gove today to ask that we and our other e-learning industry colleagues and partners be actively included in the process. Now that Mr Henley has completed his Review, we will be releasing our submission for wider consideration.